Discussion in 'Britain at Sea!' started by Andy235, Feb 11, 2018. There is not a lot of literature I have seen about the Fleet Air Arm of the RN. I know they had a number of carriers (I know some units were equipped with US Navy aircraft)? Besides Taranto, Malta and Okinawa and the disaster at Norway, what were some major actions by the Fleet Air Arm? Was their primary role during much of the war patrolling for U-Boats? I know the UK had a number of carriers, and a large naval force, but I don't know much about the Fleet Air Arm at war. Did the Fleet Air Arm have ground based units in various theaters? The FAA had a major presence in the Pacific from late '44 onward. The British Pacific Fleet was treated as a task force within the USN and participated in the battle for Okinawa and attacks on the Japanese islands as well as independent operations earlier as part of its' working up to integrate within the USN. The bulk of its' aircraft were Anglicized US models, primarily Corsairs, Hellcats and Avengers. Seafires were embarked on some carriers but, due to their limited endurance, were typically limited to CAP flights over the fleet. Not unlike the 14th Army in the CBI, they were a valiant and undeservedly overlooked ensemble. BTW, a very good read on the BPF (which was built around the strike power of the FAA) is The British Pacific Fleet by David Hobbs. Not only that, but I understand they flew them off carriers! I don't believe we did at the time. There is not a lot of literature I have seen about the Fleet Air Arm of the RN. I know they had a number of carriers (I know some units were equipped with US Navy aircraft)? Besides Taranto, Malta and Okinawa and the disaster at Norway, what were some major actions by the Fleet Air Arm? How about the poor, much maligned Sea Skua's sinking a German cruiser - IIRC the first ship sunk by dive bombing. Do you have a good source for casualties/losses during Meridian? Winkle Brown's biography gives a few nice insights into active FAA life, too, though the focus is very much more on the test flying. The book I referenced above, "The British Pacific Fleet" by David Hobbs, has a very detailed account of these operations. The naval aircraft was just called a Skua; the "Sea" prefix was used for land planes converted to naval use like the Sea Hurricane or Seafire. Most purpose-designed naval aircraft were named for marine creatures like the Swordfish or Fulmar. The Skua was designed to serve as both dive bomber and fighter; the relatively small air groups of prewar British carriers made multi-role aircraft attractive. 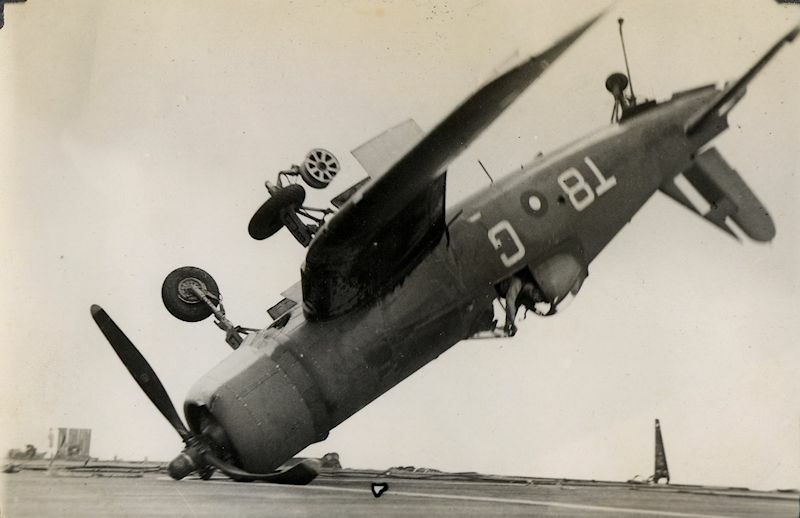 Skuas from HMS Ark Royal also scored the FAA's first aircraft kill, a Do18 flying boat. Sea Skua is a modern antiship/antiboat missile used by helicopters like the Lynx; it was employed in the Falklands war.